Supports performance recovery after resistance exercise. MuscleXP Mass Gainer contains a powerful blend of choice ingredients to help you bulk up and increase muscle mass in a healthy way. Proteins are the building blocks of our bodies. They are formed by amino acids and are an important structural component of muscles and other body tissue. Endurance athletes turn to greater protein consumption to maintain or increase muscle mass. Protein supplements are now a staple of muscle mass management programs and high-intensity training. MuscleXP Mass Gainer contains Whey Protein Concentrate, which is a premium protein derivative. MuscleXP Mass Gainer has a powerful blend of 26 vitamins and minerals. It contains vitamin C, vitamin B3, vitamin E, vitamin B5, vitamin A, vitamin B6, vitamin B2, vitamin B1, folic acid, biotin, vitamin D, vitamin B12. Among minerals, it has potassium, calcium, phosphorous, magnesium, choline, sodium, iron, zinc, manganese, copper, iodine, molybdenum, selenium and chromium. These multivitamins and minerals are indispensable to a healthy muscle mass gaining regimen. Vitamins are organic in nature and help in the metabolism of fats, carbohydrates, and proteins in the body. Minerals are inorganic and provide a slew of benefits. You can consume 1 or 2 servings per day. Maintain an adequate time interval between servings. MuscleXP Mass Gainer can be consumed after workouts, between meals, or before going to bed. AFTER WORKOUTS: Drink one serving of MuscleXP Mass Gainer 30-45 minutes after a workout to support maximum recovery. BETWEEN MEALS: Drink one serving of MuscleXP Mass Gainer between meals to support a high-calorie diet and maintain positive nitrogen balance. BEFORE BED: Drink one serving of this supplement before going to bed to provide essential nutrients to your body and support muscle recovery throughout the night. 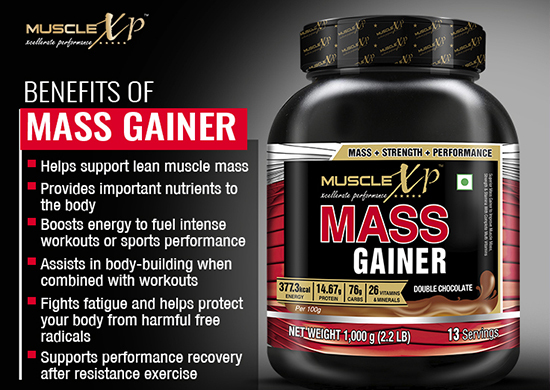 For best results, MuscleXP Mass Gainer should be combined with intense weight training three to five times a week and a healthy whole-foods diet. MuscleXPMass Gainer is not recommended for children. Allergen Information: This supplement has milk ingredients. Diluent (Maltodextrin), Skimmed Milk Powder, Whey Protein Concentrate, Cocoa Powder, Calcium Phosphate Dibasic, Inulin, Di-potassium Hydrogen Phosphate, Thickener (INS 412), Calcium Caseinate, Choline Bitartrate, Magnesium Oxide, Inositol, Sodium Chloride, L-Giutamine, DigeZyme, Sweetener (INS 955), Ferric Pyrophosphate, L- Ascorbic Acid, Zinc Sulphate Monohydrate, Beta-carotene, dl-alpha Tocopheryl Acetate, Nicotinamide, Manganese Sulphate Monohydrate, Calcium D Pantothenate, Copper Sulphate Pentahydrate, Pyridoxine Hydrochloride, Riboflavin 5' Phosphate Sodium, Thiamine Hydrochloride, Potassium Iodide, Sodium Molybdate Dihydrate, Chromium Trichloride Hexahydrate, n-pteroyl l-glutamic acid, Cyanocobalamin, Sodium Selenite Anhydrous, D-Biotin & Ergocalciferol. Packed with vitamins and minerals this is a complete drink for healthy weight gain. I am finding this very useful for meeting my calorie needs for bodybuilding. Tastes delicious. The extra calories I need to increase body weight is coming from this product. This calorie rich product is helping me in gaining muscles and healthy body weight. For one serving, add one heaped scoop of MuscleXP Mass Gainer to 250 to 300ml of water or milk, and shake it vigorously using a shaker or blender to get a rich, creamy, yummy protein shake.On the recommendation of a health-care professional, you may even opt for a heavy intake by adding two heaped scoops of this supplement in 500ml of milk or water.